HH-60 Pave Hawk - The Sikorsky made helicopter MH-60G/HH-60G Pave Hawk is used primarily for search and rescue with the United States Air Force. Combat search and rescue using special operations forces can be conducted in day or night in hostile environments as well as perform civilian search and rescue in emergency medical evacuation (MEDEVAC) missions in areas of disaster domestically and internationally when needed. UH-1N Twin Huey - The Air Force has been flying this utility helicopter for over 50 years and have plans to continue using this UH-1 model aircraft for many more years to come. By continuously sustaining and modernizing their UH-1Ns, the helicopters will continue to address flight needs of the Air Force and improve its capabilities. TH-1H Iroquois - The TH-1H Iroquois Helicopter is an Air Force pilot training machine in use since 1959. The Air Force Pilot Training program has over 30 of these in service with no future replacement on the horizon. The men and women to take care of these aircraft are Helicopter Maintenance Airmen with the Specialty Code of 2A5X2. Inspects, repairs, maintains, and services helicopters and support equipment (SE). Maintains aircraft forms and records. Troubleshoots, inspects, repairs, and services helicopter aircraft, systems, and related equipment. Inspects and functionally checks helicopter structures and systems. Checks installed components for proper operation. Adjusts, aligns, and calibrates aircraft systems. Rigs, tracks, and balances rotor systems. Inspects for fuel leaks, corrosion, tire wear, skin damage, and cracks on aircraft. Accomplishes engine maintenance and ground handling tasks. Prepares and maintains inspection and maintenance records. Operates, inspects, and checks serviceability of powered and non-powered ground SE. Inventories and inspects alternate mission equipment. Stores and prepares aircraft for shipment, and performs crash recovery. Prepares aircraft for movement to and from storage. Disassembles helicopters for shipment and reassembles. Advises on problems maintaining helicopters and related SE. Uses technical orders to diagnose and solve maintenance problems on airframe and engine related systems. Interprets inspection findings and advises on maintenance procedures to repair aircraft and related equipment. Performs staff and supervisory management functions. Coordinates and adjusts individual and unit daily maintenance plans. Supervises and assists in launching and recovering aircraft. Ensures compliance with maintenance management directives. Initiates technical order deficiency and product quality deficiency reports. Reviews maintenance data collection summaries to determine trends, production effectiveness, and areas requiring corrective action. Knowledge. Knowledge is mandatory of: supply procedures; electrical theory; mechanical principles applying to aircraft; flight theory; hydraulic principles; concepts and application of maintenance directives; maintenance data reporting; technical order use; and proper handling, use, and disposal of hazardous waste and materials. Education. For entry into this specialty, completion of high school is desirable, with courses in mechanics, physics, hydraulics, and electronics. Training. For award of AFSC 2A532X, completion of a suffix specific basic helicopter maintenance course is mandatory. 2A552. Qualification in and possession of AFSC 2A532X. Also, experience in functions such as repairing and maintaining helicopter aircraft and systems, and powered and non-powered ground SE. 2A572. Qualification in and possession of AFSC 2A552. Also, experience performing or supervising functions such as installing, repairing, inspecting, maintaining, or overhauling helicopter aircraft and systems, and powered and non-powered ground SE. Other. For entry into this specialty, normal color vision as defined in AFI 48-123, Medical Examination and Standards, is mandatory. Required Aptitude Score : M-56. 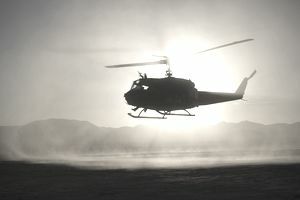 If you are considering advancing in your Air Force career and want to one day fly these helicopters: To become an Air Force helicopter pilot, you must become an officer, complete Joint Specialized Undergraduate Pilot Training (JSUPT) helicopter training at the Army Base in Fort Rucker, Ala. There are three phases of pilot training that typically takes 54 weeks. Helicopter training program graduates may choose to become UH-1, HH-60, CV-22 Osprey (Part plane and Helicopter) or First Assignment Instructor Pilots.